Pick a Pumpkin for Your Pet this Halloween! 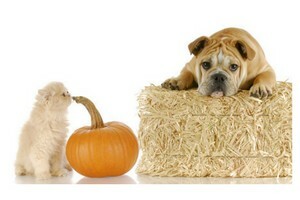 It's pumpkin season and many of our customers are wondering if pumpkins are ok for their pets. YES, they are more than okay! Pure, unseasoned pumpkin and seeds are great for your pet and offer a ton of nutrition and holistic health benefits. The orange color (think carrots) of pumpkin tells us it’s a wonderful source of Beta Carotene. It’s also a very good source of Vitamin A, Vitamin C, Vitamin E (Alpha Tocopherol), Riboflavin, Potassium, Copper and Manganese, and a good source of Thiamin, Niacin, Vitamin B6, Folate, Pantothenic Acid, Iron, Calcium, Magnesium and Phosphorus. Throw in some Omega 3 & 6 and you have yourself a very nutritious vegetable for your pet. At only around 30 calories/cup, pumpkin is low in calories while being relatively high in fiber. The nutritional benefits of pumpkin for pets include a healthier digestive, immunity support, bone and joint health, and healthy skin and hair/fur. Dogs are perfectly capable of digesting and utilizing the plethora of nutrients in pumpkin. In the wild, they would have eaten an animal who could have consumed pumpkin and the dog would have enjoyed all the nutrition from this animal. Pumpkin is considered to be low in carbohydrates and contain about half the level of starch in other winter squashes. Since carbohydrates are present in pumpkin, however, we do suggest that you feed cats sparingly and in small servings. However, most cats do seem to enjoy the taste. Pumpkin has been used as a natural remedy for both constipation and loose stools in dogs, cats, rabbits and horses due to it’s high fiber content as it's known to soothe the digestive system overall. Dogs and cats with inflammatory conditions (such as arthritis) may benefit from the mild anti-inflammatory effects of pumpkin. Also, Vitamin C found in pumpkin will also increase collagen production and induce healing. Pumpkin seeds are valued as a source of Omega 3, an anti-parasite treatment, Pumpkin is a great food to help when transitioning your animal to a raw diet. It helps settle the stomach and allows for better digestion. Ask us about what great pumpkin treats we have in store during your next visit to help share this tasty and healthy benefit with your pet.